Viknesh Vijayenthiran May 31, 2018 Comment Now! It was easily the most anticipated car of 2018 but Dodge's Challenger SRT Demon, like all good things, must come to an end. 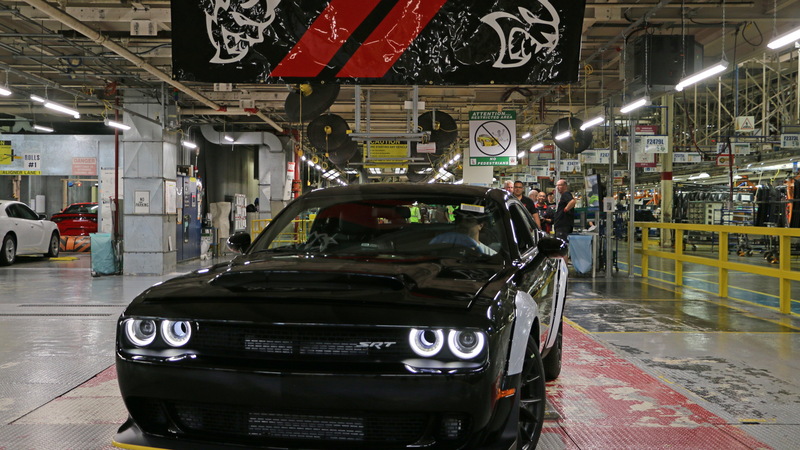 That end actually took place on Wednesday where the very last Demon, example 3,300, rolled off the line at Fiat Chrysler Automobiles' plant in Brampton, Canada. The car doesn't have an owner yet. And no, FCA isn't planning to lock it away in a heritage center. Instead, the 840-horsepower beast will be auctioned off for charity together with the very last Dodge Viper. The sale will take place during the Barrett-Jackson auction in Uncasville, Connecticut running June 20-23, and all proceeds will go to benefit the United Way charity. Although the last Demon is currently wearing a black exterior, it won't stay that way for long as Dodge plans to have it hand-painted red to match the Viper it will be sold alongside. The car will also be fitted with a one-of-a-kind VIN instrument panel badge. 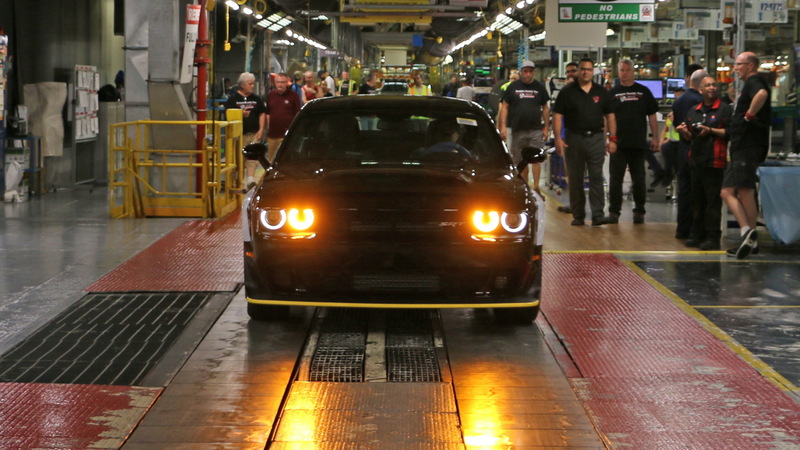 Given the strict emissions standards and industry trend toward electrification, it's safe to say there might never be a vehicle like the Demon built by a major manufacturer. Relying on a big supercharged V-8, the Demon can pull 1.8 g in acceleration, run 0-30 mph in 1.0 second and 0-60 mph in 2.3 seconds. That makes it the quickest production car in the 0-60 mph sprint in the world, regardless of pricing or powertrain. You can even get it to lift its front wheels off the ground when shooting off the line. Sadly, Dodge limited production to only 3,300 cars, split 3,000 and 300 between the United States and Canada. And it was a bargain at its asking price of $86,090, assuming you could find one for sale. 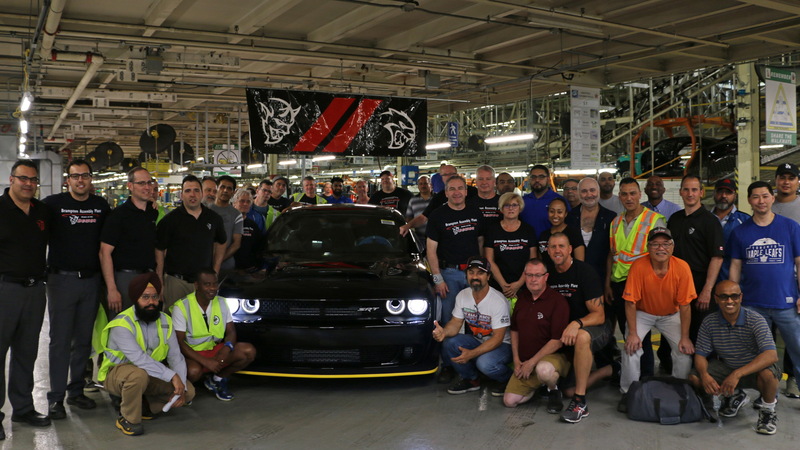 There's no way to tell how much the final one will go for, but as a gauge of what's possible we'll remind you that the first Challenger SRT Hellcat off the line managed $825,000 at an auction in 2014.